DETROIT -- General Motors Co. posted a global profit of $2.5 billion for the second quarter, helped by strong results in North America and a profit at its Opel/Vauxhall unit in Europe. GM's global net income for the April-through-June period nearly doubled from $1.3 billion in the year-earlier quarter. It was GM's sixth consecutive quarterly profit since exiting bankruptcy in mid-2009. Revenue grew 19 percent to $39.4 billion. GM reported profits in all its operating regions, including Europe where it has been struggling to restructure its Opel unit. It was the first time all four regions were profitable since the company's IPO. "GM's investments in fuel economy, design and quality are paying off around the world as our global market share growth and financial results bear out," GM CEO Dan Akerson said in a statement. "Our progress has been steady and we're preparing to launch more new products this year, including the Chevrolet Sonic in North America, the Opel/Vauxhall Zafira in Europe and the Baojun 630 in China to keep the momentum going," he said. Net income in North America rose 41 percent from the second quarter of 2010 to $2.2 billion. GM ended the quarter with $33.8 billion in automotive cash and marketable securities, up 10 percent from the end of the first quarter. GM posted a $102 million net profit in Europe for the second quarter, reversing a $160 million loss a year earlier. European revenue rose to $7.5 billion from $6 billion. GM said its European unit incurred restructuring costs of approximately $100 million, which was around $200 million less than in last year's second quarter. 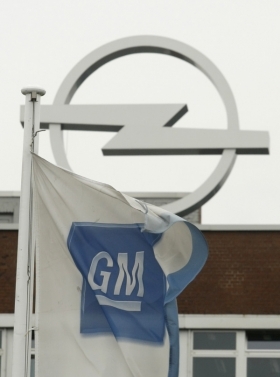 Opel/Vauxhall deliveries rose to 340,000 from 315,000 in 2010, GM said. GM, explaining why it considered regional earnings to be net rather than earnings before interest and taxes, said interest and taxes are recorded centrally at the corporate level, so "there are no reconciling items" between regional EBIT and net attributable to shareholders. GM said that "based on current industry outlook," it expects its earnings for the second half of the year to be "modestly lower" than in the first half. First-half net totaled $5.4 billion. Analysts worry that if the U.S. recovery hits a pothole in the second half, GM could be forced to raise incentives on its vehicles to lure shoppers. GM's first-quarter results were marred by heavy incentives, but the automaker dialed back those deals. The automaker also faces a new challenge in the second half as Toyota and other Japanese automakers return to full production levels and look to make up lost ground in sales. In its home market, GM is pushing heavily into smaller, more fuel-efficient cars like the popular Chevrolet Cruze, but a good portion of its profit still relies heavily on U.S. sales of more profitable trucks.